I’ve just been tidying my house, well there’s no ‘R’ in the month and the year is an even one. 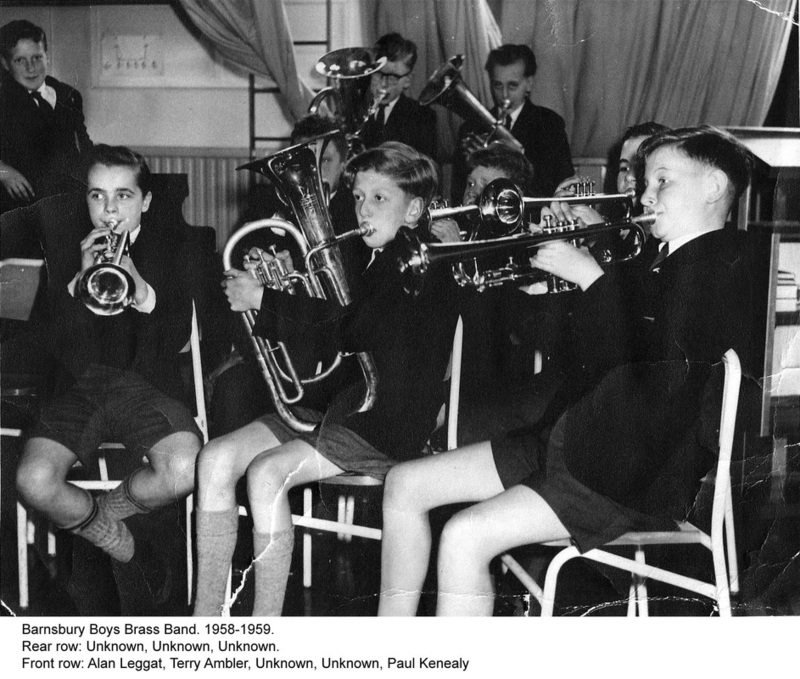 Anyway, I found two photos (enclosed) of Barnsbury Boys Brass Band (4B’s). There was a time when I could tell you ALL the names, but I’m looking for help here. Photo 1 shows me blowing my brains out in Eden Grove, must’ve been about ’59 judging by my white scrawny legs and severe haircut. The other triers I believe were Ambler and Bartlett plus Caylor or Taylor sitting in the back row. All suggestions gratefully received. Photo two shows the full band at Camden Road on a Friday Evening, probably about ’61 or ’62. The boy playing 1st Trumpet nearest to Mr McHugh is Johnny Godfrey (RIP). At the end of that line of 1st Trumpets is Peter Hayward who usually was sitting at number one. Maybe he got in late? I think I’m sitting 4th in the second trumpets, about my usual position. 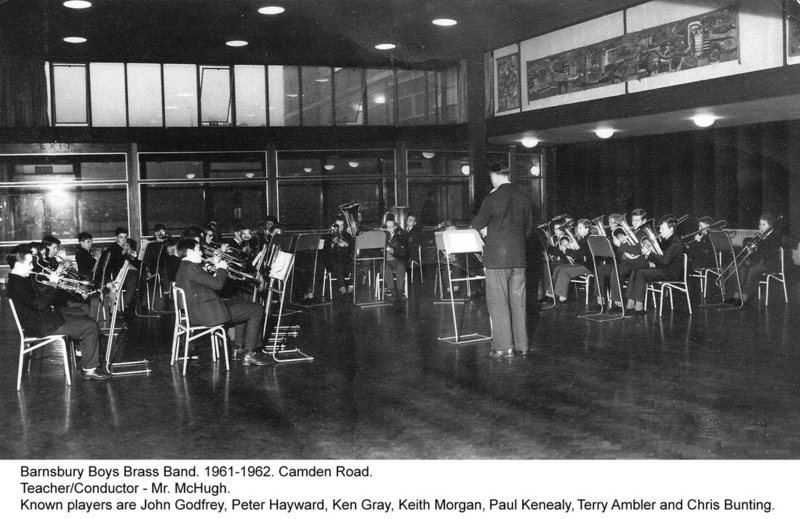 The lad playing the trombone to the right of the picture is Ken Gray. Somewhere hidden is Keith Morgan, Terry Ambler and Chris Bunting. Once again any names that come to mind may help my fading memory. As possibly the first of a dynasty of two Bartlett's to pass through the school at around this time I can confirm that the Bartlett in the back row is not me, by 59 I would have been at Camden Road and the nearest I ever got to an instrument of any kind would be a triangle at infants school and I can safely say I failed to grasp the musical concept . I had a cousin Michael who followed me into the school about this time, but he sat on his wind instrument. One of my class mates Tony Nemeth was in the band from early on and I have been trying to make contact, does anybody have any recollections. 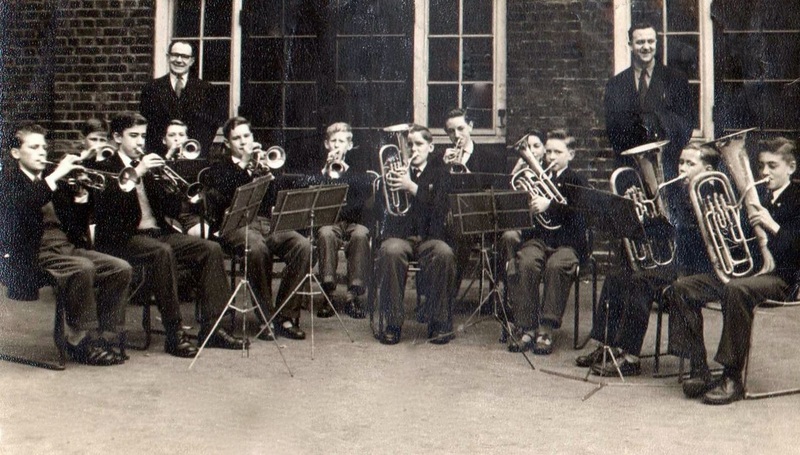 I think the trumpet player in the front row on the left is Allan Leggatt (Liverpool Buildings). If so he used to practice on the roof of the buildings. I was in an amateur music troupe along with him, charity shows etc. He may have been listed as The Boy With Golden Trumpet. I have a programme somewhere for Tavistock Hall?, Kings Cross. The Dagenham Girl Pipers on same bill. 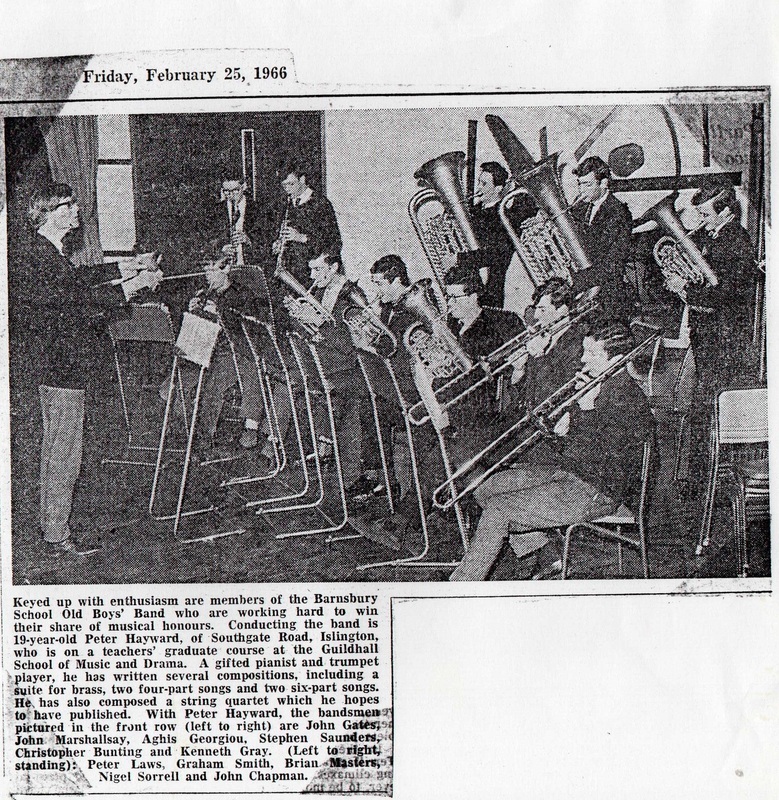 I suspect the euphonium player at the back with glasses could be John Fairbanks? Sorry John if I am wrong. No, it's not me, I'm afraid. However, there is a clue in the bottom page that they must have been first year boys, as they have short trousers. I'm sure the rule was short trousers for first year boys, graduating to long trousers in the second year. I remember the horn player sitting in the front row - was his name Gardener? I'm sure he was a year ahead of me, which if so, would make this 1958, if he's a first year. I remember Kenny Gray on trombone, the other trombonist I remember from my time was Ernie Michael, who I think was Freddie Drew's cousin, and like Freddie lived Angel way. Paul, did Terry Ambler used to play Eb Bass? You are both right. The trumpet player was Alan Leggatt. I had forgotten his name but not his reputation as The Boy With The Golden Trumpet. McHugh hated him, although he was a perfectly competent player McHugh never put him better than 3rd Trumpet. He was laughed at by the kids in his year (same as mine). He had a better horn than the rest of us. We all had to buy our trumpets from Boosey and Hawkes who did a special deal for schools. Mine was 21 quid on the never never for about five bob a week. He (Leggatt) had a much better instrument, a Selmer or similar with a pull slide on the third valve; you remember these things, like when your mate gets a 5-gear bike when you only have a fixed wheel. Anyway his mum used to come to the school on Friday afternoons with his trumpet, and used to wait in the corridor and walk him home after school. I believe he played with Ray Baldwin at the town hall. I think he's the first trumpet player in the second row. Fancy having played on the same bill as the Dagenham Girl Pipers, wow. Did you pull? You are right about the guy on Eb Bass, it was Gardner, sorry I don’t remember his first name. Also Terry Ambler is the one in the second row playing cornet, but he ended up on either Eb bass or Euphonium. I seem to remember he and Chris Bunting could hide in the cases of their Basses. The year was definitely the '58 -'59 term, and yes I did wear short trousers all the way to Camden Road, Micky, although I thought it was my Mum being unreasonable. I still have that Boosey and Hawkes trumpet, although I only play Christmas Carols on it now. Thanks Paul, it's always reassuring to think my memory is working well enough to keep Alzheimer's at bay (just!). Hadn't realised that Terry first played the cornet - I only ever knew him hiding (with me) amongst the basses! No, I must have misled you. 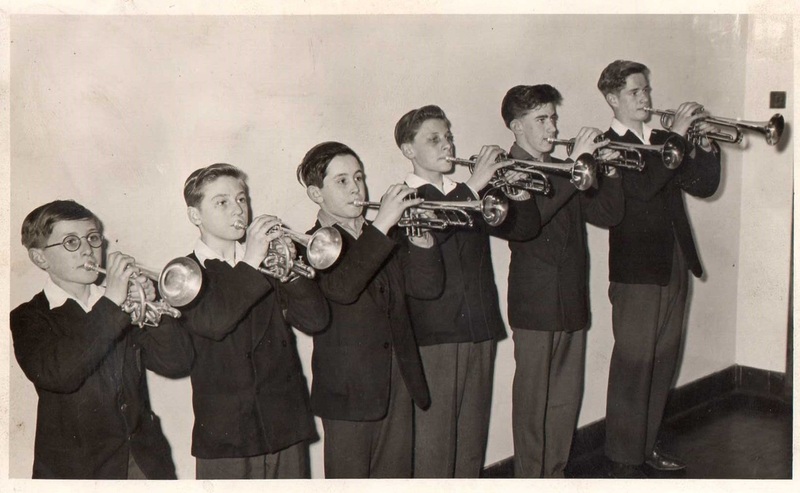 We all started on the cornet, then McHugh decided who would play what, so Terry Ambler in that 1958 photo was in the back row playing cornet, later to be in the boiler room with the om pah pah's. You were lucky playing bass, cos McHugh didn't blow your horns. He would often stand behind the cornets and say 'that sounds like the bloody Salvation Army', take your instrument and blow the 'correct' notes. When you got it back it stank of 'Old Holborn'. I never wore short trousers as my legs were not a pretty sight! I don't recognise anyone else in the Eden Grove pic. I do remember Ian Hatt, 1st Horn. His speciality was playing 'Wipe Out' on the snare drum to perfection. I knocked about with David Gardner for a lot of years as a youngster but I don't think he played any instruments as he was always bunking off with me. Well Mick, its like this. I sent the photos to James in the right order, but he forwarded them in the wrong order. So, the picture that's second should be number one. So far so good. So, picture number one of us scrawny legged first years has a boy between me (right) and Alan Leggat (left) playing a tenor horn who I didn't remember, but John Fairbanks said was Gardner, and Griff Lewis said his name was David Gardner. Whoever he was I'm sure he never bunked off with you in the first year, cos we were all terrified of Petherick. My brain is getting dull, must have some cocoa before bed, if Matron will let me in the kitchen. Right. Look at school photos - 1C and 3C - there is a fair headed kid called John Gardiner. Could he be the one? I agree with Micky Simmonds. There is no way Davey Gardner play with instruments. Well, not those ones. When I first said to McHugh about wanting to join the band, he gave me a trumpet and asked me to blow. He then told me I wouldn't be any good for the trumpet as I didn't have the lip for it. He then told me to take home a tenor horn for a week, to see if I could get a tune out of it. I was lucky because I could read music having played the recorder at Thornhill Primary. However, quite quickly McHugh moved me on to a euphonium - it seems I had the lip for oompahing! Barnsbury Boys School Brass Band - Eden Grove. Peter Laws second left at the back with Headmaster Mr. T. J. H. Davies & Music Teacher, Mr McHugh.